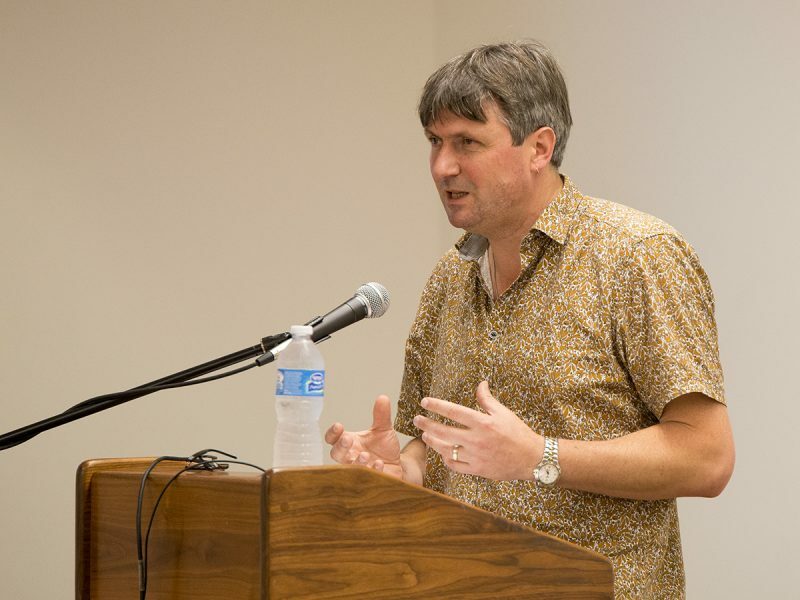 One of England’s leading poets and current professor of poetry at Oxford Simon Armitage gave a reading followed by a book signing last Wednesday at INTS 1113. He read about 10 poems that spanned his career, from his early work in “Seeing Stars” to his translation of “Sir Gawain and the Green Knight.” The crowd was decent sized, with about 40 people which included students as well as professors, many of whom were familiar with Armitage’s wide body of work. Overall, the entire event was intimate and inviting, with Armitage being very open to questions. The first poem he read was titled “Thank You for Waiting” which was a wonderfully witty and sly poem, recited as if the narrator was a flight attendant. As Armitage began his reading, he invited us into his comic world. 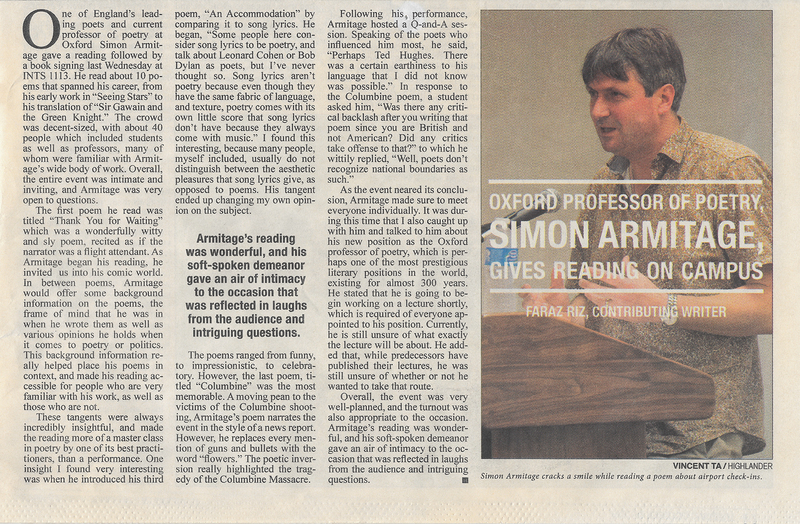 In between poems, Armitage would offer some background information on the poems, the frame of mind that he was in when he wrote them as well as various opinions he holds when it comes to poetry or politics. This background information really helped place his poems in context, and made his reading accessible for people who are very familiar with his work, as well as those who are not. These tangents were always incredibly insightful, and made the reading more of a master class in poetry by one of its best practitioners, than a performance. One insight I found very interesting was when he introduced his third poem, “An Accommodation” by comparing it to song lyrics. He began, “Some people here consider song lyrics to be poetry, and talk about Leonard Cohen or Bob Dylan as poets, but I’ve never thought so. Song lyrics aren’t poetry because even though they have the same fabric of language, and texture, poetry comes with its own little score that song lyrics don’t have because they always come with music.” I found this interesting, because many people, myself included, usually do not distinguish between the aesthetic pleasures that song lyrics give, as opposed to poems. His tangent ended up changing my own opinion on the subject. The poems ranged from funny, to impressionistic, to celebratory. However, the last poem, titled “Columbine” was the most memorable. A moving pean to the victims of the Columbine shooting, Armitage’s poem narrates the event in the style of a news report. However, he replaces every mention of guns and bullets with the word “flowers.” The poetic inversion really highlighted the tragedy of the Columbine Massacre.